Design inspiration image above via Jaimee Rose Interiors. Whew! I’ve now painted my first ceiling, and my neck is happy to have a break...though it was probably a good reverse stretch from always looking down at the baby and/or phone. Re-plumb to get water lines away from the exterior walls, following a pipe freezing incident this past winter. Bring in the light: this small room was painted and tiled in dark blue hues, so we’re going with a much lighter palette and adding a window (exciting!...but wait for this week’s not-so-great window surprise below…). Make better use of available space: a corner shower that had us shimmying in and out becomes a full-wall alcove, and we’ll replace an oversized toilet and medicine cabinet with a slimmer toilet and shelving. We’re getting rid of a dome light/fan and replacing it with a humidity-sensing light/fan and a vanity light. Combine modern and vintage-inspired elements for a similar style as the rest of our 1930 colonial revival. The plumbing, insulation, shower installation, and wall and ceiling plastering have been completed (these were not DIY projects for us—our contractor and his subs did a very nice job, though...looks better already, right?). On the Monday holiday, I headed to the paint store to pick out colors for the bathroom, with help from the store’s color consultant, who had done a great job helping us select colors for the rest of the house (shout out to Becky and Johnson Paint of Waltham!). 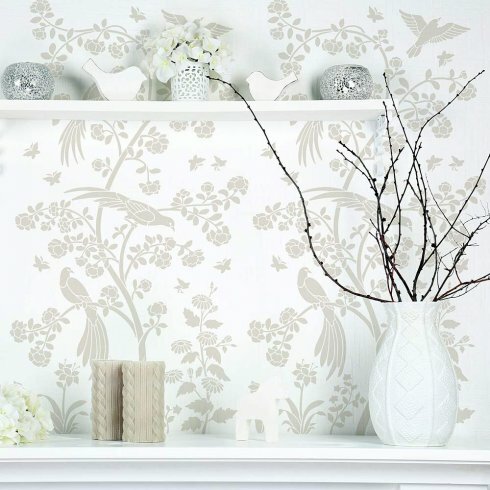 Following last week’s post in which I debated whether to try a stencil in lieu of wallpaper, I heard a lot of great advice from people who have tried them. I decided to take the plunge and try two coordinating stencils from Cutting Edge Stencils on the upper half of the bathroom walls: Birds and Berries, and Birds and Roses. The company is generously sponsoring part of this stenciling project, and based on all the great feedback I’ve heard from others who’ve used their stencils, I’m excited for how it will look in my bathroom. Birds and Roses stencil from Cutting Edge Stencils. I’ll stencil the upper half of the walls, painting the background in Dove White (below, bottom of the stack), which coordinates well with our floor tiles. 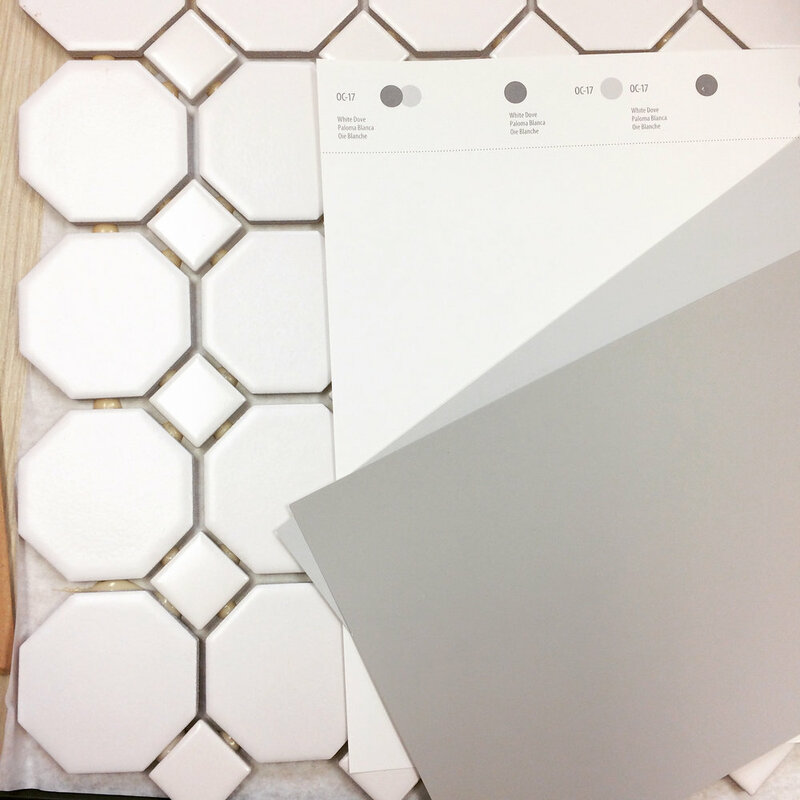 Tip: bring your tile with you to the paint store—I forgot mine and had to go right back home to get it so that Becky and I could check out which off-white colors had the right undertones and which grays would coordinate well. For the majority of the stencil and the lower half of the walls, I’ll use Benjamin Moore’s Silver Chain (the color in the middle of the stack below). The darkest gray, Gray Huskie, will be a small accent on the stencil. We’ll do a chair rail to separate the wall halves. When I got home from the paint store, we primed the ceiling and walls, and on Monday night I put two coats of paint on the ceiling. For once, I was glad it’s a small space! 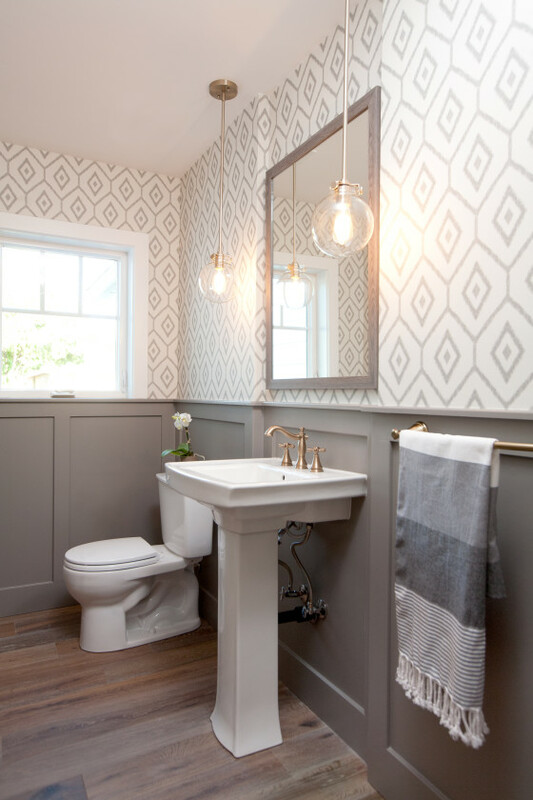 Color palette: Benjamin Moore's Dove White, Silver Chain, and Gray Huskie, with American Olean Sausalito floor tiles. Our awning-style window for the bathroom arrived yesterday, along with the huge bay window we ordered to replace the drafty one in the adjoining office. The good news is that the expensive bay window looks excellent. Unfortunately, the bathroom window arrived with the exterior frame and muntins in a color that doesn’t match the rest of the windows in the house. We went with dark bronze for the other windows, but the color that arrived was more of an almond. Our contractor called the company right away, but it might be a few weeks until the replacement arrives, so we could have a problem there. I’m hopeful that my reveal photos won’t have a big old piece of plywood where the window should be! Let's hope the final view into the bathroom is better than this one. 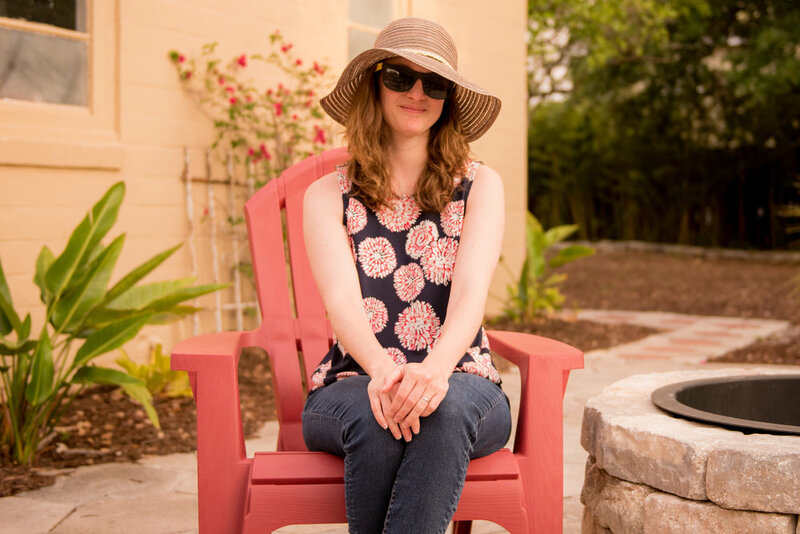 I’ve been enjoying reading everyone else’s updates, from the featured designers to the guest participants, and really appreciate the conversations on Instagram with many of you. Many thanks to Linda for creating and hosting the One Room Challenge™, to media partner House Beautiful, and to everyone I’ve been meeting. Please feel free to say hi below—I know there are a lot of cool blogs I haven't gotten to check out yet, so I'd love to know about yours. Special thanks again to @cuttingedgestencils for sponsoring my stenciling endeavor. I’m excited to get started! But first, I need to do a test area and get two coats of base paint onto the walls, hopefully some evening this week.